Back in August I was asked to take photos for the debut EP of Cardboard Castle, a local, Oxfordshire band, who are not only great musicians but wonderful people to boot. After a few talks about what they wanted, we bundled into the car and drove the tiny, winding roads to Bernwood Forest. Anyone who has looked at my photography before knows how much I love green, leafy, natural settings, combine that with the golden hour and I am pretty much in heaven. We arrived when the sun was starting to set but couldn’t find the location we were looking for, or rather, the location we were looking for was so overgrown that at least one band member would be lost in the grass. Luckily for us, a very excitable dog took interest and with that dog (whose name I cannot remember, but I do remember him being incredibly cute) came his owner, who pointed us in the direction of what would become our set. It was perfect; a grassy path bordered on each side with trees, and the sun setting behind the trees (a word comes to mind: komorebi, the Japanese word for sunlight filtering through trees). It wasn’t dappled, it was just soft and golden. Due to the time of day, there was no one about and our shoot was pretty much uninterrupted. While it is nice when people take an interest, I do prefer photoshoots in which I don’t have an audience, where I can be more relaxed and not super aware that there are people standing behind me, quite possibly judging every shot I take. I knew before the shoot started that I didn’t want it to look too staged, people always look their best when they are at their most relaxed (unless you count me right now, sprawled on a sofa in my PJs – comfy but not photogenic). Other than getting them to stand/sit where I wanted them, I didn’t give any direction at all. The guys played their instruments and Georgina (who may be referred to as Gorg later) stood in the middle, reacting to things they were doing and enjoying the scenery, opting not to sing in case of unfortunate expressions. Hopping about, taking photos as I went, I left them to it and it paid off. I knew which shot would end up on the EP as soon as I’d taken the photo, and while I did offer them more options, I knew that this would be the one. It was, in fact, one of the only photos I took the time to expand. If you’ve ever heard me talk about my photography, you already know I prefer to expand rather than crop. It’s always better to make an image larger, than smaller, so expansion photos are a pretty crucial part of the process. Once we’d finished taking the EP images, I shot a load of random portraits before we hopped back in car and went home in the last fleeting moments of daylight. I always had a pretty clear idea of what I wanted the colours to look like and stuck pretty closely to what I could see while the shoot was happening. The camera dulled the warm tones and I very much wanted to bring them back. Cardboard Castle often perform quite bright, happy, playful sounding songs so I wanted the colours to reflect that, while their posing and expressions were more serious. I didn’t want to do a huge amount to the images, so it was mainly just colouring and contrast. 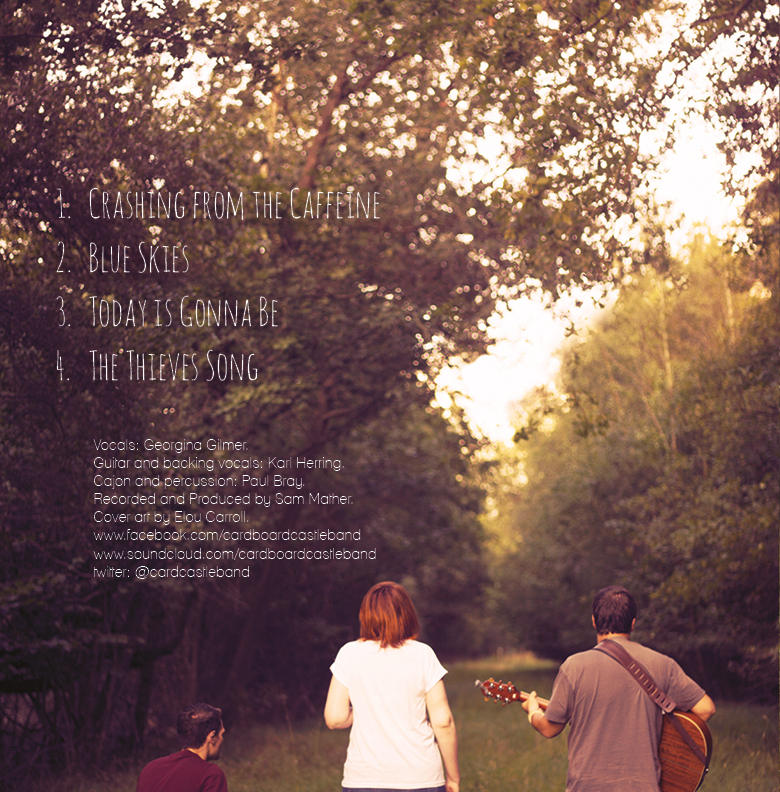 The back cover required a different edit due to my standing with the sun behind me, I had to make sure the trees were dark enough to make the text readable and that there was enough space. Again, I didn’t do too much to it. The edit was mostly trial and error, while I was clear on what I wanted for the front, I hadn’t made any editing plans for the back. I played with fonts for a while, I knew I wanted something playful, sans serif, possibly handwritten but I wasn’t sure. The original draft of the type was a very thin sans serif with a doodled castle bordering the top right corner. The castle didn’t take, I couldn’t get it to look as crisp and clean as I wanted and after a few trials, it wasn’t really something I thought worth pursuing. Perhaps, on later EPs (providing they keep me!) I will attempt to bring it back but for this EP simpler was best. The fonts I ended up with are Belta for the logo, Amatic SC for the EP title and tracklist, and Lane – Narrow for the back cover credit text. The tracklist could have been centred, but that approach looked better on a different image. All in all, a simple design from the off.